For the joy of the chase… Carlin CA! For a dog Carlin’s size, a Coursing Ability Test course is at least 600 yards. 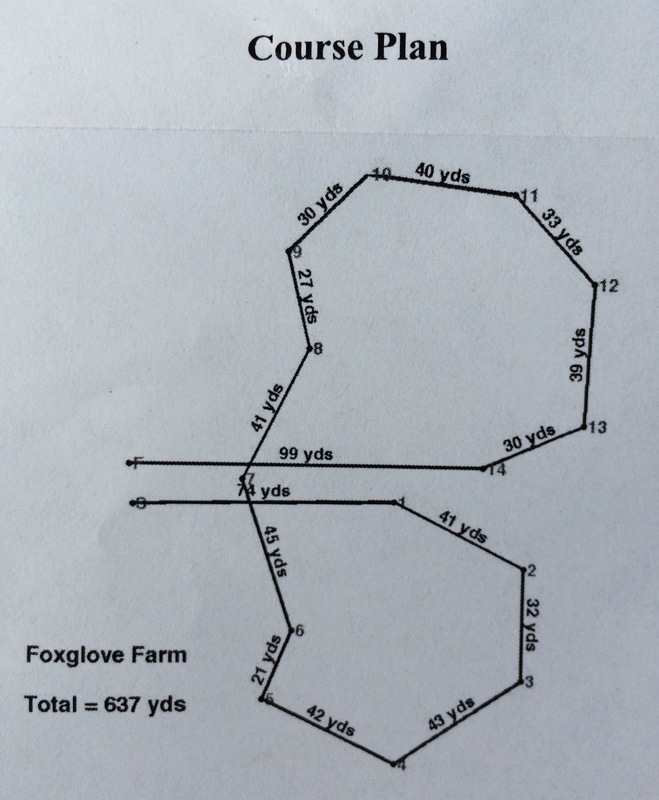 The course for today’s test, put on by the Chintimini Kennel Club, was 637 yards. The course was mostly flat with just a few dips and swales. The cover was quite short — it looked like the grass had been cut recently, and that perhaps a few drops of rain had fallen in the recent past, making the field a carpet of gold with flecks of green. And the morning started out cloudy and relatively cool. Everyone was grateful for this, as it would be more comfortable for the dogs, who were going to be putting out a lot of hot panting effort in a very short period of time. Carlin finished that first run with dedication and enthusiasm. He is such a beautiful dog to watch run. I wish I could have been both the handler and a photographer so I could get pictures, but if you saw the video of his first run, you know what I mean. Carlin passed that test, finishing the course in 1 minute 3.78 seconds. Then we waited for the rest of the dogs to finish so the group can start the second run. The field was relatively small, so they ran the same course again, this time in reverse. That messed with the dogs’ minds a bit, especially if the dog has been running often enough to understand that corners can be cut, thus reducing the distance. (This is legal.) Oddly, Carlin did get a little confused at about 1/3 of the way through of the second run. The plastic bag bunnies ran through a shallow swale, and going that direction, they were briefly hidden from sight. Just for those few moment, Carlin lost them and he slowed way down, looking around. This is where the skill of the Lure Operator comes in. He slowed the lure down and then alternately slowed and sped it up. This jerky movement caught Carlin’s eye, and he was off again. Surprisingly, even with his slight difficulty, Carlin ran that second run a little faster than the first: 1 minute 3.41 seconds. And he did it with enthusiasm and dedication. So that was his third pass overall, earning his first title. 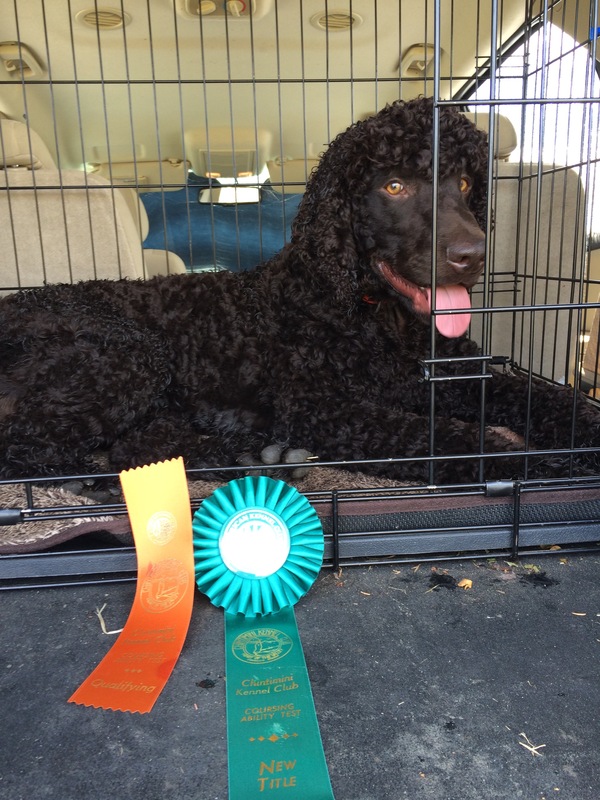 As soon as the AKC records it, he will be Realta’s Carlin O’Whistlestop CA. Today we finally had deliciously cool weather, clouds, and even rain. A perfect day to go stand outside and watch some Lure Coursing trials. Lure Coursing is a sport for sight hounds, like Salukis, Borzois, Pharaoh Hounds, Greyhounds, Whippets, Rhodesian Ridgebacks, and others. 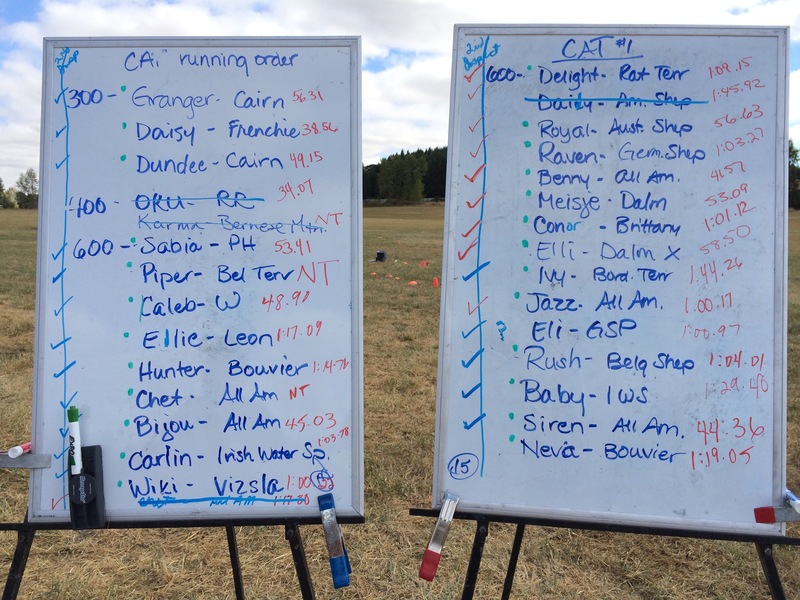 Today the Afghan Hound Club of Greater Portland put on a Lure Coursing Trial, and along with it, a Coursing Ability Test (CAT). The CAT is an event similar to Lure Coursing that is open to non-sight hounds. (Irish Water Spaniels, for example.) To pass the test, a dog runs, pursuing a lure, completing the course with enthusiasm and without interruption within a given time. For a dog of Carlin’s size, it’s about a 600 yard course that must be completed in under 2 minutes. The course is made up of straights, curves, and turns. The lure in this case, was a series of black and white plastic bags that are pulled on cables by a system of mechanized pulleys, situated so that the course simulates the unpredictability of chasing live prey. So after watching several dozen sight hounds do their thing for several hours, we decided to enter Carlin in the Coursing Ability test, just for the heck of it. See the video below to find out how the boy did. We timed it: just 50 seconds from when the Hunt Master sent us off with a “Tallyho!” to Carlin’s crossing the finish line, 642 yards later. I was really pleased, especially since a few of the sight hounds, for whom this sport was designed, ran the same course for the Lure Coursing trial, and instead of finishing the course, lost the bags, lost interest, or tried to run off the course.